You can manage your applications, generate authentication credentials, and share the applications with others. 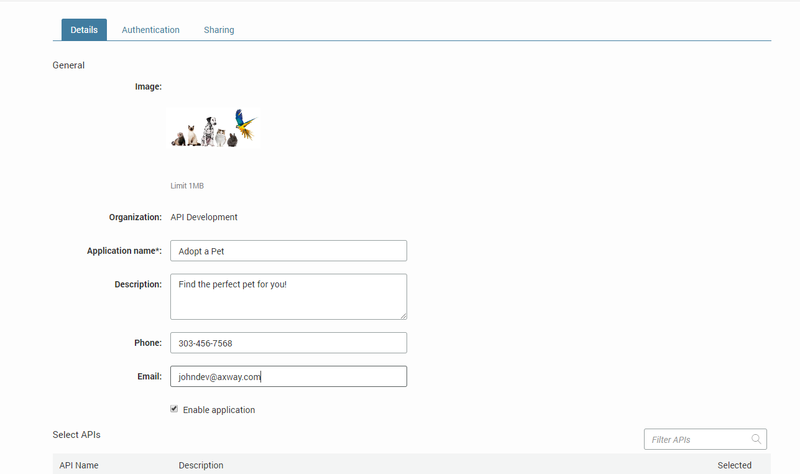 You can edit the basic details of your application, such as the application name, description, and which APIs it uses. Click the application you want to edit to open the application details page. Click Edit application to open the application for editing. On the Details tab, edit the basic details of the application and select which APIs it uses. If an API your application uses is protected with authentication method in API Manager, the application must authenticate as a client to access the API. For authentication, you must generate credentials for your application. The Authentication tab lists the API Keys, External credentials, and OAuth credentials. The available authentication methods depend what authentication methods have been configured in API Gateway. Click the application you want and select Edit application. On the Authentication tab, click the authentication method you want. To generate credentials, click Generate. If needed, fill in the required details. Edit: Edit the configuration details of the credentials. View secret: View the secret key generated for the application. Disable: Disable the credentials without deleting them. The credentials are shown as inactive in the credentials list, with an icon indicating they are disabled. Delete: Delete the generated credentials. In addition to generating the credentials for your application, the Authentication tabs shows what application scopes API administrator has defined for the application in API Manager. The scopes can also be assigned on method-level inside an API. You may want to invite other API Portal users to collaborate on your application. You can share the application with them, and define their access level. Click the application you want and select Edit application > Sharing. To share the application with a user, click Add user. Select the users you want to share the application with, and click Apply. By default, the users are only able to view the application, not edit it. To change the access rights of an user, toggle the View and Edit buttons next to the user's name as needed. To remove the access to the application from an users, click Remove next to the user's name. On the Applications page, click the application you want to open the Details page. The Delete application button is also available when editing the application.